mama elephant | design blog: OCTOBER RELEASE PREVIEWS - DAY 1! OCTOBER RELEASE PREVIEWS - DAY 1! Welcome to the official kick off of our October Anniversary Release festivities! We are celebrating 3 years since we've opened our doors with a month-long celebration with a fantastic release, a sold-out party in NYC, inspiration and prizes, amazing designers joining us throughout October... and of course the fantastic new products! Now let's get on with the previews! You've seen us peeking Reindeer Games all over social media. I'll confirm that these little reindeers are as cute and full of personality as you've imagined! We've included a few scene building options and accessories as well as a couple of birdie pals to join the reindeers! Creating the perfect holiday scene just got a whole lot merrier! There is a coordinating Creative Cuts die set sold separately for Reindeer Games. On the flip side, Twinkle Towns is completely elegant and classy! We've included a city scene as well as a country/village scene. I am completely smitten with Twinkle Towns - it's full of possibilities and so great for technique based stamping! There is a coordinating Creative Cuts die set sold separately for Twinkle Towns. Luli Bunny is back this month with two stellar sets of holiday stamps. We just can not get enough of her illustrations. They are so full of imagination and fun! Christmas Spirit will quickly capture your hearts with the adorable little elves and penguins... and we all know how much we LOVE penguins around here! There is a coordinating Creative Cuts die set sold separately for Christmas Spirit. Christmas Scene is a also designed by Luli Bunny and complements Christmas Spirit above. This is perfect to build festive scenes around the elves and penguins or just use alone! She has designed so many little ornaments for that big tree! 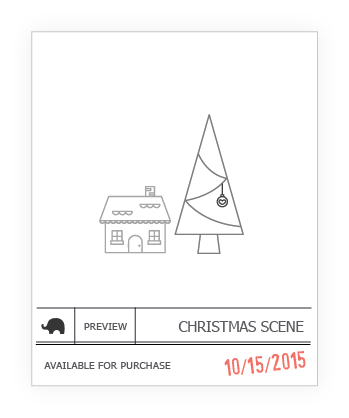 There is a coordinating Creative Cuts die set sold separately for Christmas Scene. That's a wrap for day 1 of previews! Do you have an early favorite? Let us know what you think! All new October Anniversary Release products will be available for sale in our shop October 15th, 12:00AM EST. You can also find our products worldwide at your favorite retailers! I can't wait to see the full reveal of Reindeer Games! SOOO Cute! I love the cute little raindeer! He looks so huggable! Can't wait to see what else you have!! Ooh. Great previews! Can't wait to see the rest. See you soon! They alll look great, but Reindeer Games is my favorite so far from the preview! OMG these peeks looks awesome! I want the twinkle town stamps! Can't wait to see all the new releases. Nice job. j'adore Reindeer Games, il est trop mignon ! They are just TOO cute! So looking forward to the reveal. Love the reindeer and elf. So cute! 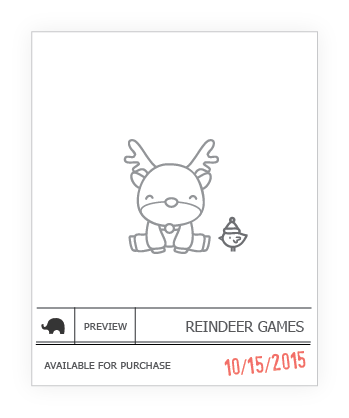 Reinder Games is so cute....I can't wait to see new release..Thanks ME..
❤️❤️❤️the reindeer!!! Can't wait to see them all in person next week!!! the little reindeer is darling. Love the cityscape in the ornament. Okay, I can't wait to see the whole shebang now!! :D TFS the sneaks! I absolutely love Reindeer Games. I saw it first on IG when you sneaked it, and I knew I had to have it!! I love Twinkle Towns, too! 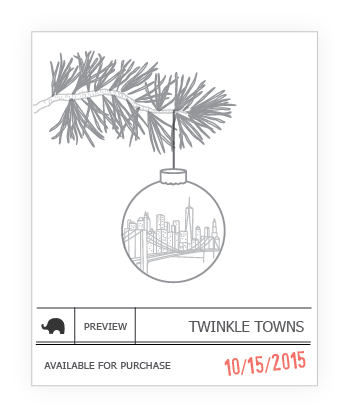 Living in the Bay Area, I can't wait to get my hands on the Twinkle Towns - and the Reindeer Games makes me so happy!! Oh my!! So cute they make me smile :) can't wait!! That little reindeer is too cute! Reindeer games is my favorite! 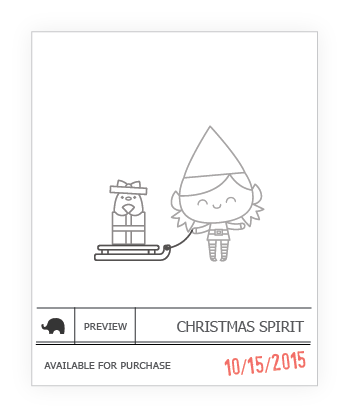 I can not wait to buy Reindeer Games and Christmas Spirit! ! But they look amazing! Oh that little deer is soo cute!!! They are all awesome, but that reindeer is just the cutest! Reindeer Games looks really fun to color, but they're all adorable! I'm keeping my fingers crossed that we'll see some of Luli Bunny's Tandem Ride/Meowloween characters in holiday/winter garb! These are all great, but my favorite is Reindeer Games, that one melts my heart! *SQUEAL! * I'm gonna love reindeer games I can already tell. Can't wait to see more! My favorite is the Christmas Scene. I'm so excited for this release . My wallet is even ready for this one.squealing ! !!!! Cute reindeer! Can't wait to see the entire set! Can't wait...the sneak peeks look amazing! That little reindeer is needed in my life right now! I can totally see myself buying pretty much everything in this release, but I think my husband might kill me! I'm really liking the Twinkle Towns set! Oh the reindeer's are my favorite! Can't wait! My favorite so far is Twinkle Town. What a great release! I love it all. Oh, the reindeer and Twinkle Town is just adorable! Can't wait t see the reveal and all the fab projects! The reindeer are my favorite but everything you do is wonderful!!!!! !